Each morning as I climb away from Newark, I wonder what sort of glory will be provided by the coming dawn. By the time that the sun actually rises I will be 150 miles away, but still I look at the day's first light in the northeast to see if the sky offers a hint. I watch, wait, and anticipate while daybreak moves into dawn. As the sky brightened last Wednesday morning, I could see a cloud bank in the distant right. It was unusual in that it was a fairly regular deck of tightly grouped puffy clouds with a jagged ...almost saw-toothed... ridge of clouds at its far edge. The ridge contained small clouds that were profoundly vertical in nature; almost like miniature thunderheads. It became apparent that I was gradually converging with these clouds as I traveled northwest. 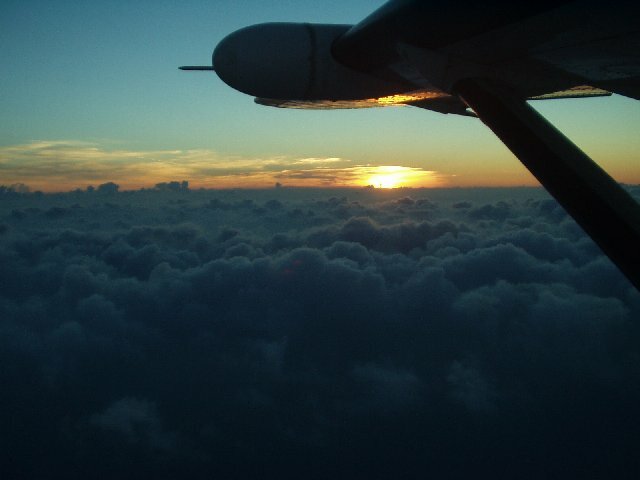 The sun makes a bright spot on the horizon as I cruise above puffy clouds at 8000ft. I took several pictures as I flew along in the brightening sky, and by the time that I was crossing Canandaigua Lake, the cloud deck had melted into a thick haze below my altitude. The vertical clouds had crumbled too, but their remnants cast long shadows into the golden sunlight that had set the haze aglow. It was a fascinating sight, like pillared ruins standing in desert sands. I knew that I was looking at the pretty side of bad news, but that was OK. There was talk of thunderstorms for that evening, and the sight of small clouds able to blow straight up at dawn is a confirmation that the atmosphere was becoming unstable. Wednesday was hazy, hot, and humid, and it was no surprise to see thunderstorms erupt in the late afternoon. I had an uneventful 8 PM trip from Elmira to Rochester, but my 10 PM departure from Rochester was made in rain that was flanking a thunderstorm. I paralleled the easterly track of the storm until I could cut in front of it, and thought that my worries were over. The controller called to say that "the computer" had re-routed my flight over the Catskills rather than the Poconos, but that the storms in that area were dissipating rapidly. I flew on happily, with the assurance given by the controller. As I crossed Hancock, I passed into the next control sector, and things were different. This was a more easterly sector, closer to the action around the City. It was apparent that this sector was the twilight zone, where the Computer's projections were met by the facts of the weather. Some poor guy in a business turboprop wanted to turn right, around a storm, but the controller couldn't let him. Other planes were being given holding instructions. I realized that the rest of this flight would be busy, because once planes start to hold, there is no guarantee of anything. Arrival could be delayed minutes or hours, and the hold could last so long that the plane would have to go someplace else for fuel before resuming the trip. 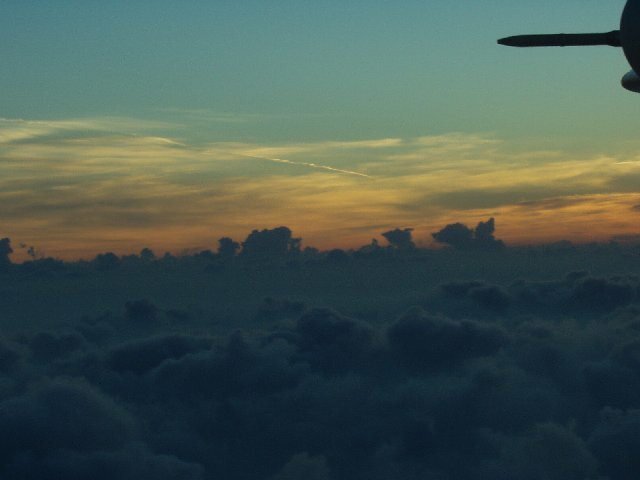 Once you are given a hold, you have to know what sort of weather is around, what airports are available for refueling, and how long you can stay in the hold before you must break away. I was just entering the sector, and as soon as the controller got the other planes settled into holds, he told me to return to Hancock and hold there. For the next half hour I flew race- track ovals ten miles on a side while I figured my options and listened to what was going on ahead of me. When I was released from the hold I was told that there would be no further delays, but shortly I was put into a stack of other company Caravans in a holding pattern near Port Jervis. After fifteen minutes we were sent on our way one by one, a caravan of Caravans in a line heading for Newark's short runway. We landed, and the first guys helped the later arrivals tie their planes down, so that we could make the long walk to the freight terminal together. We laughed about the evening, exchanged the last 24 hours of Company gossip, and told the usual sorts of jokes on the way in. We walked in long purposeful strides, anxious to close out the flights and sit down for a quick nap. After all, it was only three hours before time to take off and wonder what sort of glories will be provided by the coming dawn. *Update - Wasaya Airways has issued this statement: Wasaya Airways has learned Search And Rescue (SARs) ground crews have reached the aircraft site of Wasaya flight 127. Upon arrival, crews found the lone occupant of the aircraft, our Captain Nick Little, not responsive and he could not be resuscitated. Rescue crews are on site now and will remain on site through the night awaiting additional resources to airlift our fallen crew member home. Rescue efforts were hindered by poor weather conditions in the area. A helicopter dispatched was unable to reach the site due to heavy icing. The Ontario Provincial Police, together with SARs technicians, launched a ground rescue initiative at approximately 3:51 PM when it was clear the helicopter was unable to reach the site. The SARs Techs arrived at the aircraft site on foot at approximately 10:50 PM. Wasaya Airways has issued a statement at 9:21 am. that it has received information that Flight 127 was "overdue and no longer in radio contact." 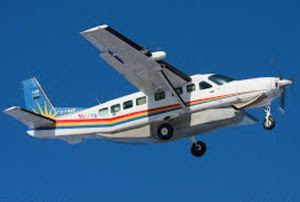 The airplane of concern is a Cessna Grand Caravan. It was carrying cargo from Pickle Lake, ON Canada (CYPL) to Wapekeka First Nation, ON. (CKB6). The flight distance of 166.5mi (268km) should have taken about an hour. It is believed that there is only one person on-board, the pilot. Search and Rescue personnel are actively searching along the flight path.